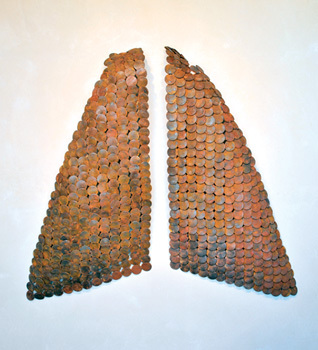 The tenderness with which Paula Castillo re-works found metal into her art approaches the "wholeness" that Rilke may have intended. No matter how long ago we ripped shiny ore from a mountain, or kidnapped a lode of gold from otherwise gaily rippling river banks in quiet places where trout flickered, Castillo re-presents to us the violence that results, unintended, from our belief that we are separate from the Earth and must somehow conquer it in order to survive. The artist asks, without a lick of stridency, that we consider the benevolence of our footprints today. Life can be harsh; must our legacy be so as well? Castillo's abstract sculptures are made from worn metal bits found in the mountainous country of her hometown--a land that looks back hundreds of years to its earliest Spanish settlers, and beyond, to its indigenous inhabitants. Put together in shapes reminiscent of the valleys and (scarce) rivers of Northern New Mexico, Castillo's metal works reference the battered, dull sheen of a 17th-century conquistador's helmet--an unwelcome symbol, to say the least, for many who came before. But Spanish and Native peoples have long shared the struggle to endure along the corridor of the Rio Grande, and Castillo's allusions to their means of survival indicate the possibilities of reconciliation. So many of her mediums once existed as fencing brackets, nails, or other types of the myriad fasteners found in abundance on any hard-scrabble farm; through their use, Castillo gives thanks on behalf of those who came before her for the extraordinary gift of life. Her gratitude to her ancestors and to the Earth itself is heartfelt; one readily discovers it in the smallest pieces, earns animales (a un tiempo) (we once were animals), which are almost cuddly, toy-like, with their nail heads pounded and welded into the endearing shapes of a mama creature with her two babies. One of the largest pieces is a pair of nearly five-foot angel wings titled para imitarla (to mimic), which with its rust-gold discs forming the entirety, suggests Icarus and the hubris of flying too close to the sun that hangs over a wild, unforgiving county. Another large work, empty maps, arcs nearly four feet off the wall from which its metallic bands hang, telling not only of roads riven through the terrain, but of wholeness torn open.